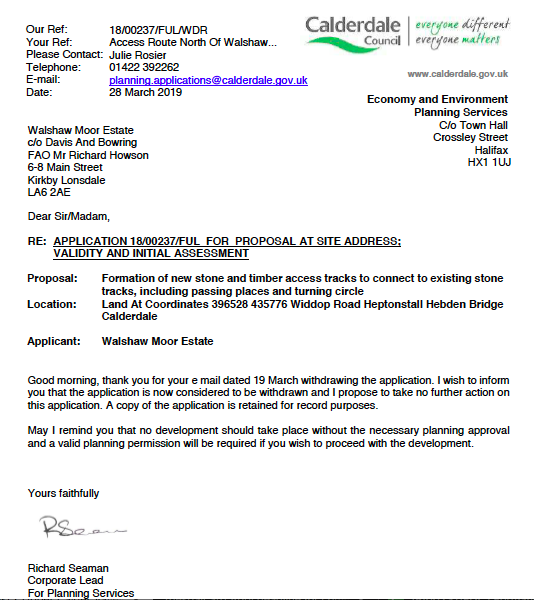 On 19th March this year, Walshaw Moor Estate emailed Calderdale Council Planning Services to withdraw their APPLICATION 18/00237/FUL.On 29th March, Calderdale Council’s Corporate Lead for Planning Services replied that the Council noted the withdrawal of the planning application and that Walshaw Moor Estate is not to put in any developments without planning permission. We need to keep a close eye on Walshaw Moor, to see if they abide by this requirement. Which seems unlikely, if their past unconsented developments are anything to go by. This entry was posted in Ban the Burn News and tagged 18/00237/FUL, Calderdale Council, Planning application stone and timber access tracks, Walshaw Moor Estate by jenny. Bookmark the permalink.